Hungarian painter, photographer, filmmaker, typographer and educator. He studied law in Budapest, and later served in WW I. While convalescing from a war wound, he took up painting. After the war, he worked his way across Germany as a letterer and sign painter, arriving in Berlin in 1921, where he took up painting and experimental photography. He became influenced by the Dutch camp of Theo van Doesburg, and in 1922 participated in the Dada and Constructivist Conference organized by van Doesburg in Weimar, Germany. He was introduced to Gropius by Adolph Behne, and joined the Bauhaus in 1923 where he took over as Master of the metal workshop, and after Johannes Itten left, took over the school’s influential Preliminary Course, assisted by Josef Albers. Moholy- Nagy changed the course drastically from Itten’s metaphysics, meditation, intuition and emotionality to Moholy-Nagy’s focus on basic techniques and new industrial materials. His rational and forceful personality led the Bauhaus in a new direction that embraced technology and resulted in student designs being successfully manufactured for commercial purposes. When Walter Gropius resigned as head of the Bauhaus in 1928 due to Socialist pressures, Moholy-Nagy also resigned. In 1929 he wrote Von Material zu Arckitektur (From Material to Architecture) which was translated in 1932 as, The New Vision. The book was written to inform lay-people and artists about the basic elements of the famous Bauhaus education where theory and practice in design were so successfully merged in a program of invention and creation. It presented a new philosophy of art and industry that denied the traditional distinction between the "fine" and "applied" arts. 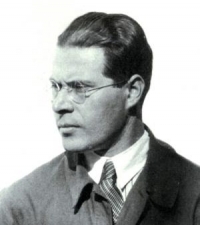 Moholy-Nagy worked in Berlin, Amsterdam, and from 1935 to 1937, in London. In 1937 he left Germany for Chicago at the invitation of Walter Gropius to become director of the School of Design at the Association of Arts and Industries in Chicago, which he promptly re-named "The New Bauhaus: American School of Design." He concurrently founded the "Chicago Institute of Design Research" with Sigfried Gideon as director. The school attracted only 20 students and closed in 1938, but was re-opened in 1939 as the School of Design under the patronage of Walter Paepcke, president of the Container Corporation of America. In 1944 the school became the Institute of Design, and was absorbed by the Illinois Institute of Technology in 1946, after Moholy-Nagy’s death. He wrote a book describing his major work and philosophy, Vision in Motion, published by Paul Theobald, Chicago, in 1946. The book focused on the student work at the Institute of Design.